The tones in the sky turn from cool to warm as the day begins. The sun rises slowly on the horizon, but it takes a while to clear the last remaining clouds from a storm that just passed. Low clouds drift slowly by the rocky cliffs surrounding the temple. The towns below are still silent as the monks’ morning chants echo through the mountains. Geumsan Mountain — what a perfect place to start the day on Namhae Island. Located in Gyeongsangnam-do, Namhae is Korea’s fifth-largest island. It consists of two islands, both connected to the mainland and each other by bridges: the larger island of Namhae-do and the smaller Changseon-do to the northeast. As is true with all parts of Hallyeohaesang National Park, Namhae offers splendid landscapes and amazing sea views. The scenic drive alone brings droves of visitors, especially on the weekends. 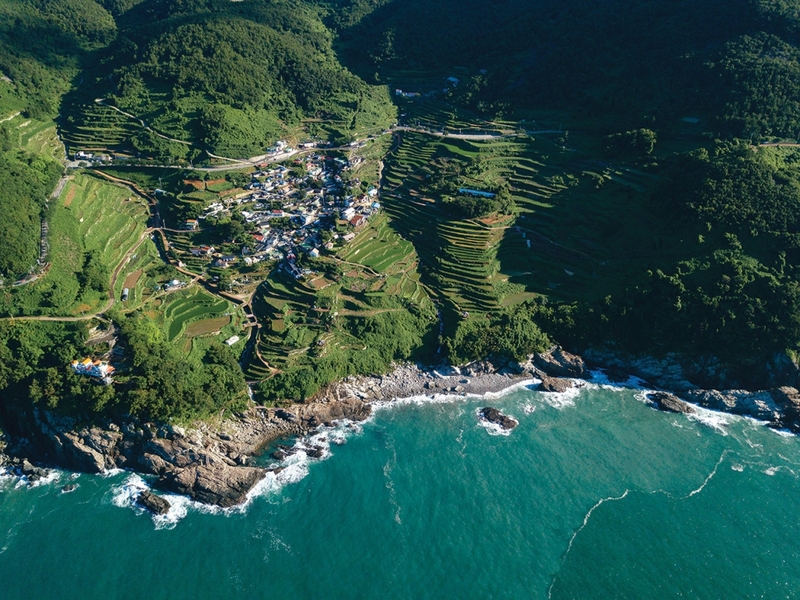 Namhae is primarily farming and fishing country, well-known for producing rice, garlic and anchovies. More recently, Namhae has earned recognition as one of the country’s hottest tourist destinations. High atop Geumsan Mountain on Namhae-do is the Boriam Hermitage. Built in the year 683 by the famous monk Wonhyo-daesa, the temple is known for its three-story pagoda that overlooks the ocean. The first Joseon king Taejo was said to have prayed here for 100 days before he became ruler of the land. Boriam also features one of three Haesu Gwaneum (Seawater Great Goddess Buddha) statues in Korea. Its mountaintop location offers beautiful panoramic views of the island below and is an especially good spot to watch the sunrise. Visitors may drive, hike or take the shuttle bus up to the scenic temple. Daraengi Village is one of Namhae’s most well-known locations. This farming village on the island’s southern coast is famous for its beautiful farming terraces among unforgiving coastal cliffs. Early villagers built the terraces, 108 of them to be exact, one at a time on the steep mountainside using stone walls. Their perseverance turned a harsh landscape into fertile farmland for crops such as rice and garlic. It also, perhaps unwittingly, transformed the area into a unique and picturesque landscape that attracts visitors from all over. More recently, Daraengi Village’s popularity has prompted some villagers to move from farming to opening cafés, restaurants and accommodations for visitors. Another wonderful example of Namhae’s culture and ingenuity is the jukbangnyeom, or V-shaped bamboo weirs. The fast-moving waters in the Jijok Strait made conventional fishing difficult, so fishermen invented jukbangnyeom to use the strong currents to their advantage. The shape of the weir allows the fish to be drawn into the net during high tide. Come low tide, the water drains out of the trap, leaving the fish to be harvested. According to locals, the fast-moving currents in the Jijok Strait make the anchovies especially firm. Moreover, the design of the jukbangnyeom supposedly prevents bruising of the fish, making for a higher quality product. For this reason, jukbang myeolchi tend to have higher market prices than conventionally harvested anchovies. To this day, you can see the jukbangnyeom in the Jijok Straight, between the two islands of Namhae-do and Changseon-do. 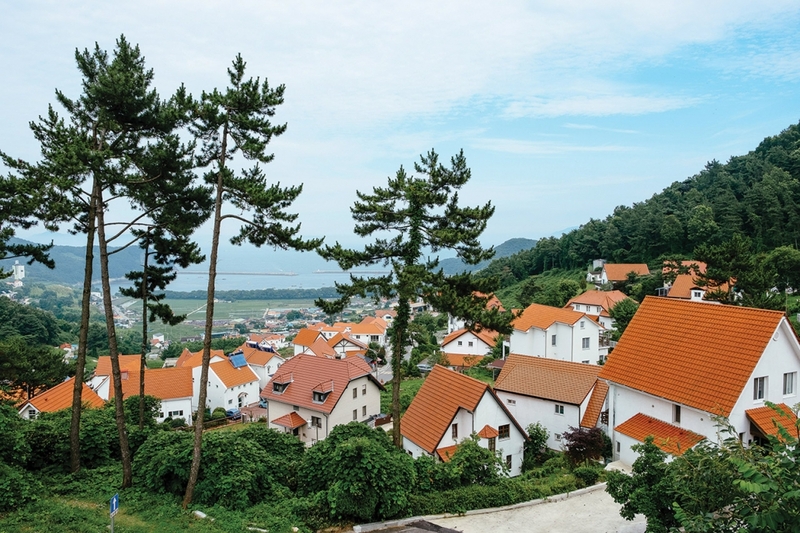 Namhae is home to two foreign villages. The first and arguably more popular is the German Village. The village was built as a retirement community for Korean miners and nurses who went to Germany in the 1960s to help grow the then-developing Korean economy. As compensation for their service, the Korean government established the German Village in the 2000s for those who chose to return home. Importing materials directly from Germany, the 30 or so houses in the village were built in the German architectural style and each given a German name. Visitors to the German village can enjoy restaurants and cafés serving German fare such as schnitzel, sausages and beer. The village also hosts an annual Oktoberfest, where visitors can enjoy performances, concerts and, of course, a wide selection of beer. The second village is the American Village. Originally designed for Korean-Americans who dreamt of returning to and retiring in their homeland, the village consists of houses inspired by suburban America. Currently, most of the houses seem to be “pensions,” or guest houses for rent. The Americana that can be found inside the village makes the experience even more interesting. It may not be everyone’s cup of tea, but it’s definitely something unique to see in the Korean countryside. No island experience would be complete without beaches, and Namhae offers visitors numerous options. Sangju Silver Sand Beach is the largest one. With its 2-kilometer stretch of white sand, Sangju Beach is a popular destination all year round for camping, water sports, swimming and just relaxing with friends and family. The pine forest that lines the beach provides cooling shade for hot summer days. There are plenty of restaurants and shops around the area, making for a convenient beachgoing experience. For a quieter time by the sea, you may visit the smaller but no less beautiful beaches on Namhae Island. Sachon Beach on the southwestern coast and Songjeong Solbaram Beach in Mijo-myeon offer fine white sand and swim-friendly waters with fewer crowds. There are also numerous other smaller beaches and coves to be discovered along Namhae’s scenic coastal drive. Namhae is well known for its rustic, countryside charms. However, during the past couple of years it has risen in popularity as a destination for a younger demographic. The success of Korea’s “healing” campaigns, television and media exposure, and an increase of young, artistic and enterprising individuals leaving the big city for the countryside all seem to be factors contributing to this. Add the fact that Namhae Island is easily accessible from the mainland by bridge and it’s easy to see why Namhae is being called a hotspot for tourists. As you explore Namhae, you will definitely notice hip, young and unique establishments against the countryside backdrop, each representing their owner’s unique interests and aspirations. Dolchango Project is one such place. Founded by two artists, the Dolchango Project’s mission is to provide an exhibition space for young artists who may otherwise struggle to find opportunities in the cities. Their stone warehouse in Simun Village is one of the realizations of this vision. The original structure was built in 1967 and was once used to store grain and fertilizer. 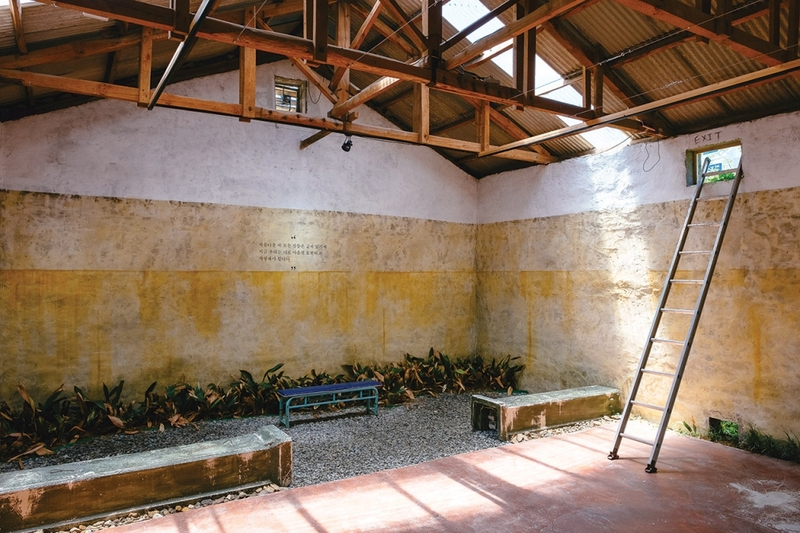 It was abandoned until the Dolchango Project converted it into an art museum, café and artist residence. They currently have two locations and are looking to use the stone warehouses around Namhae to build more. Another interesting establishment is B-Class Store. This is the home and workshop of Sejin Woo, a fairly young woodworker who left the big-city grind of Seoul for a quieter, more fulfilling life in the countryside. 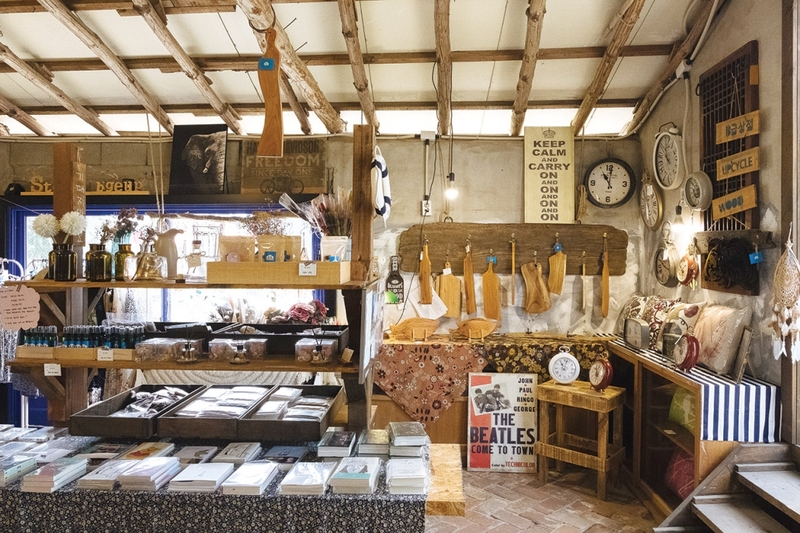 In the small compound you will find his rooftop workshop and a gift shop where you can find souvenirs, books and, of course Mr. Woo’s handmade wood crafts and furniture. You may also enjoy a cup of coffee in the quaint but relaxing yard. 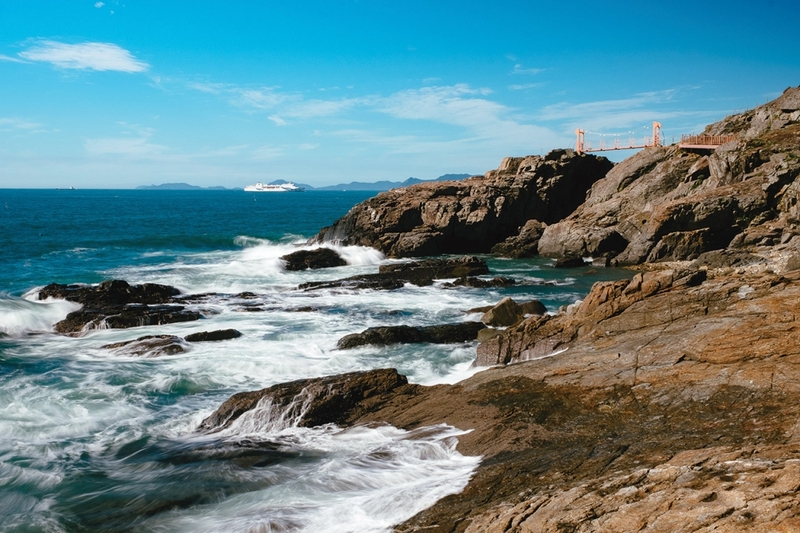 Other notable attractions around Namhae Island include European-inspired Seomi Garden, local favorite Café Yuja, and Hawaii-themed restaurant Alo Hawaii. Oftentimes, these establishments will seem to be in the most unlikely of places, which adds to their charm. STAY> Namhae has a wide variety of accommodations, ranging from small bed-and-breakfasts and pensions to five-star hotels and even a golf resort. Chances are your favorite B&B or hotel website will have the right accommodations for you. EAT> Namhae is famous for its high-quality anchovies, and the island’s signature dish is the myeolchi ssambap. There are many places to get this delicious anchovy, rice and lettuce dish along the Jijok Strait. But you will definitely want to try Uri Sikdang, who has been serving it for 40 years. GO> Driving or renting a car would probably be the best way to get to and around Namhae, as the island is large and the attractions tend to be spread out. However, it is not impossible to commute. From the Seoul Nambu Bus Terminal, take the 4.5-hour bus ride to the Namhae Intercity Bus Terminal. From there, local buses and taxis would be the best way to get around. Motorcycles also seem to be a popular mode of transportation around the island.